All the Thais stared at me as I stepped up the stairs and searched for a seat, or a free railing to grab onto in the midst of fellow sweaty commuters. The Thais were probably wondering what a white girl was doing on a bus going to the Bangkok suburbs, at 7:30p.m. when most farangs (foreigners) stuck to the Bangkok streets. Most farangs probably wouldn’t spend an hour traveling outside of Bangkok to see someone after getting off work at 7 p.m. and having to work the next day. But I wasn’t going to see just anyone. I was going to see Dominic—my Thai boyfriend who became my Thai fiance and now is my Thai husband. And I was going to eat some amazing pad thai. Thankfully there was a market across the street from Dom’s quaint studio apartment that he shared with his roommate. I was usually so hungry by the time I arrived that after I stepped off the bus we would stroll to the lively maze of vendors and meander around with clasped hands and stars dancing in our eyes. One of my favorite vendors in the market was the pad thai lady. 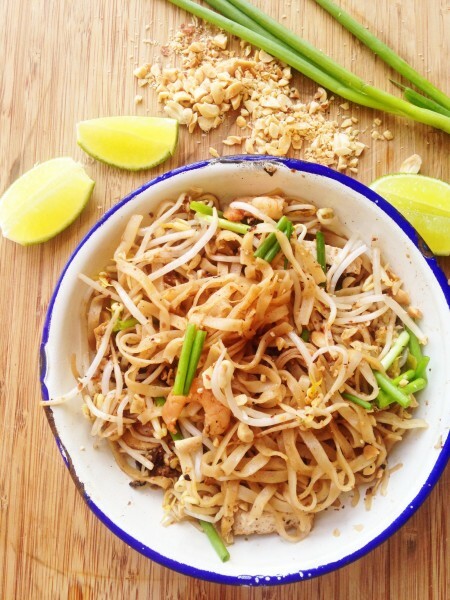 Unlike in America, pad thai isn’t found at every restaurant in Thailand, instead its sold by pad thai street vendors. 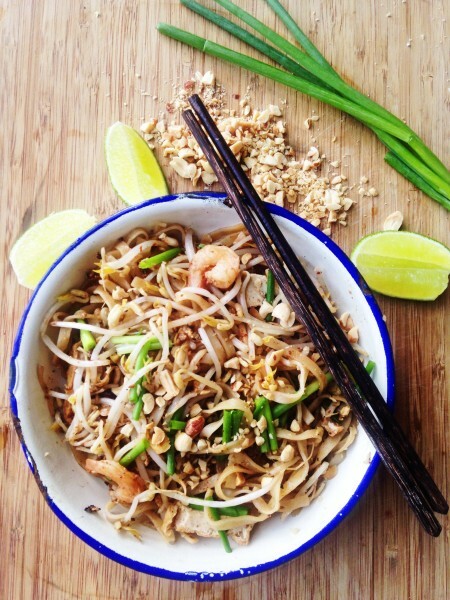 Certain vendors spend their whole lives cooking only pad thai, and as a result become renowned experts. This is why most Thais never make pad thai at home, since they can get it on the street so cheap, and it’s so good. Her sauce wasn’t too sweet like some vendors’, the noodles weren’t mushy or dry—it was smooth and slippery and flavorful and alroy mak (so delicious). I never liked the mini dried shrimp found in legit pad thai though, so Dom would always ask her to leave it out and roll his eyes at my silly American girl ways. She would slide the steamy masterpiece in a small styrofoam container, place some banana fronds on top and fresh chinese garlic chives and put it in a small plastic bag. Then Dom and I would walk back across the street to his apartment and have our romantic dinner Thai-style on the floor. 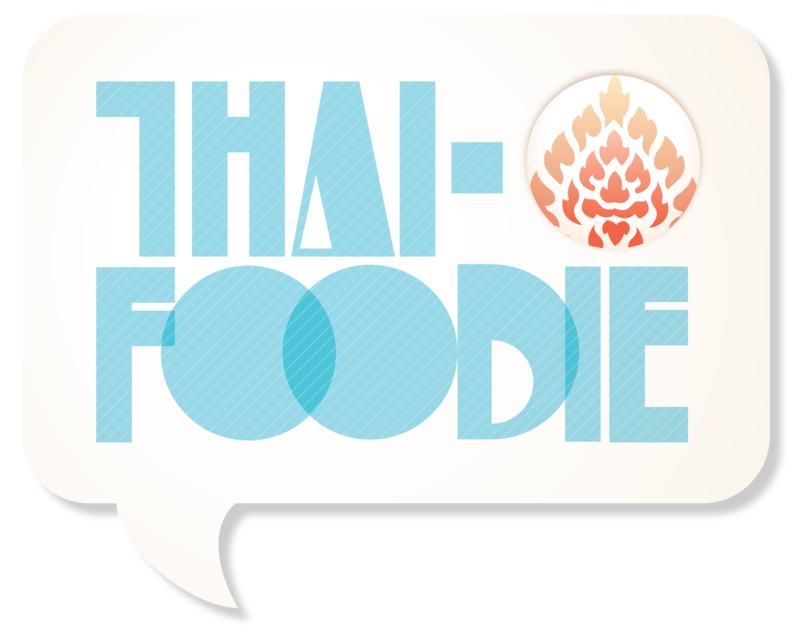 The scent of tamarind perfumed the air as we ate, and my heart pitter-pattered as I gazed at my strong, sweet Thai man. As I started to yawn an hour or so after my last bite, Dom would walk me to the bus stop. We would wait together until the bus pulled up, kiss farewell, and I would climb up the bus steps back to Bangkok. As I looked out the window of the empty bus and watched him walk back towards his place, my heart felt heavy. I always wished I never had to leave him. And now my wish came true—and I didn’t even have to leave the pad thai behind. I now make it for us in our little Austin apartment, and we still eat it romantically, now at a table, but my heart still pitter-patters. 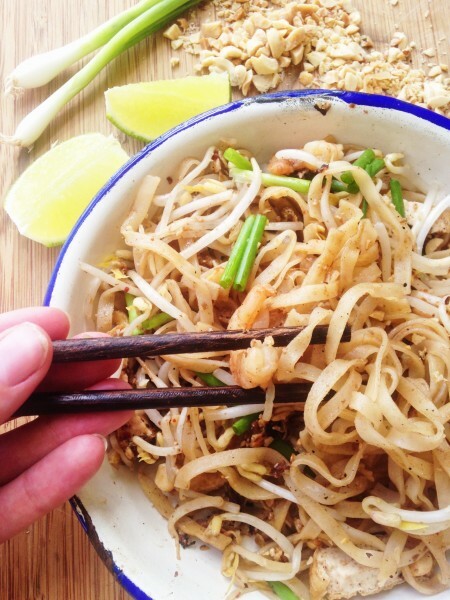 I know many Americans love pad thai, and its one of their favorite Thai dishes, so I hope this recipe helps you make it. 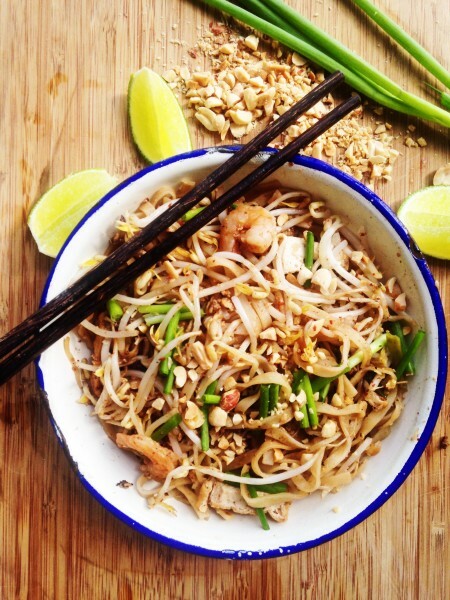 I learned the best pad thai methods through this awesome five part pad thai series on shesimmers.com. If you want more in-depth descriptions on this recipe, go there. Have fun making it, and one day I hope you can get it made for you on the street from an authentic pad thai street vendor and experience it like you never had before—and fall in love again. 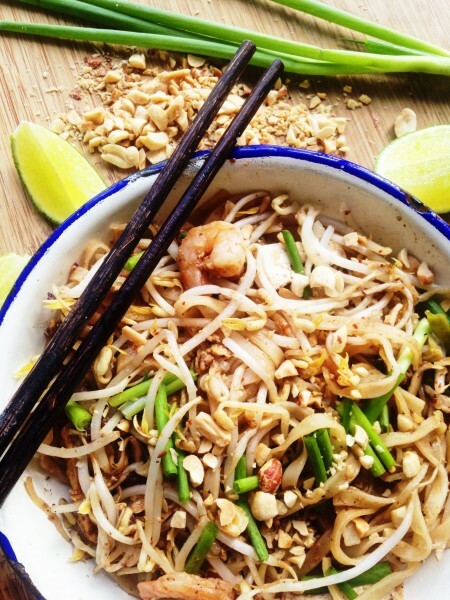 Get your pad thai fix at home! Fall in love with this classic dish in a new way at your own kitchen table! *If you use these ingredients your pad thai will taste more authentic, but if you don't use them, it will still taste yummy, don't fear. *If you can't find palm sugar, use more brown sugar. If you can't find fresh green chives, use green onions. *If you can't find tamarind pulp or don't want to make your own tamarind paste, you can buy tamarind paste at an Asian store. But usually its more watery than when you make your own, so you need to be extra sure you don't add too much to the noodles. Soggy pad thai is not fun! If i can’t find any tamarind paste in Jackson Hole, is there anything I can substitute, or a mixture I could whip up? Great question Erin! The tamarind paste is the sour flavor in pad thai sauce, so I would recommend using lime juice if you can’t find tamarind. You can order it on Amazon too!